By Dave Sylvestro with Eve Kessler, Esq. If there’s one thing that parents of kids with LD know, it’s that there are no quick fixes for their child’s learning struggles. But understanding the difficulties your child faces daily is the first step toward successfully addressing them. Kids with language learning disorders often have difficulty making themselves understood and/or understanding others. When bombarded with sensory input in the classroom, making sense of it all is an uphill slog for struggling students. Unlike their non-LD classmates they have difficulty processing everything simultaneously: listening to the teacher, looking at the board, watching the speaker’s body language, distilling the essential information that should be outlined, and taking notes legibly and in a manner likely to be helpful is at best stressful and at worst not possible. In addition to impacting their academics, these same deficits may lead to social problems as well. Their inability to engage in the fray of fast-paced school-yard communication may leave them sitting alone at the lunch table; difficulties keeping up with multi-step directions or learning to play games may leave them isolated on the playground. Attention issues take the form of under-focusing, over-focusing, distractibility, or hyperactivity. Poor organization and planning skills, and delayed development are symptomatic of executive function disorders. ADHD—and the poor executive functioning and higher-level thinking skills that often accompany it—make getting through the day difficult and stressful. Whether sitting at circle-time, attempting schoolwork, homework, or chores, or interacting with others, your child’s ability to perform successfully may be inhibited by disorganization, poor time-management and the inability to prioritize. In addition, with these problems, brain development often lags behind physical maturation, so the challenges may appear even more pronounced. And while some improvement to their deficits may “click” into place as your child matures, most young adults do not leave their ADHD or executive dysfunction behind. 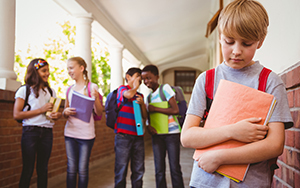 Kids with LD and ADHD may have numerous social difficulties. They may misinterpret tones of voice and have trouble modulating their own. They may be overly rigid, not understand personal space and boundaries, and have trouble with the reciprocal nature of friendship, affecting their ability to make and keep friends. These kids will remember being the last one picked and the first one picked on, as educator Rick Lavoie explains. But they will also remember when others are kind to them and make them feel successful. Every day is a different day for students with LD and ADHD: they never know which student they will be when they walk out of the house. After studying hard and thinking they understand a topic, they may do well on a test or they may fail. This inconsistency in performance works against them, reinforcing a belief that they are “stupid” and squelching a willingness to try new things. They feel that even if they do everything they are supposed to do they will still probably fail, so they often just stop trying. Because of their impulsivity, students with ADHD and LD are likely to launch into projects before thinking them through or take risks without fully understanding the consequences. They may engage in inappropriate and dangerous behaviors and fall in with the wrong friends. Their lack of thoughtfulness and control lead to unforeseen—often negative—results. Kids with ADHD and LD tend to be out of touch with their emotions and quick to anger or fear. They do not understand “how their engines run” or how to self-regulate throughout the day. This lack of self-control may result in anxiety, tantrums, and other outbursts. Often, kids will be able to hold it together during school only to fall apart as soon as they get home. Compounding the challenges they face in corralling their emotions, kids with LD often struggle to articulate their feelings effectively enough to help others understand what they are experiencing. There are numerous skills and strategies that children can learn as they move forward. And there are many ways that you can help your child, always keeping in mind that the way you communicate with your kids is important. The power of positive communication cannot be overemphasized. How you say what you say is as important as the words themselves. Model patience: Teach your children that learning and understanding take time: they shouldn’t expect to acquire knowledge automatically or absorb information easily (as many other kids can). Patience is a skill that can be taught by modeling. Encourage persistence and show support: Kids with LD have a history of failure. Although success seems unlikely at times, they must learn that if they persist, actively seek the help they need, and practice patience with themselves and others, they can indeed succeed—and that you’ll be right there with them, cheering them on. Keep it simple. Slow down. Repeat. Break down instructions into small parts. Kids with LD often feel overwhelmed by “too many words” and are unable to make sense of them. When speaking with your child, slow down and repeat directions (not just 3 times, but 13 times if necessary), check for comprehension respectfully and recognize that he still might not get it perfectly. Explain his learning profile: Make sure your child understands his own learning style and how he learns best under various circumstances. Assist him with the language to use to explain his challenges and strengths to teachers, coaches, and friends. Encourage positive self-talk and thoughtfulness: Encourage your child to think things through before acting and to recognize and appreciate the significance of cause and effect. For example, “If I do this, X is likely to happen; if I don’t do this, Y is likely to happen.” Kids learn this best when they see and hear your thought processes; it’s helpful to speak aloud the sequence of steps you’re thinking as you plan and problem-solve. Provide reassurance: Reassure him that he will be okay in new situations, for example, “Stay calm and don’t panic when the math teacher transitions to a topic that is new to you.” Let him know that positive outcomes are possible. Work on the vocabulary of emotions: Help your child to describe gradients of feelings, similar to medical gradients indicating levels of pain. For example, instead of saying he feels “bad” about everything, help him understand the differences between an emotional level 3, where he may feel sad about not doing as well as expected on a quiz, and a level 9, where he may feel angry and out of control. Assure him that it is okay and natural to have feelings across the entire emotional spectrum and that, in time, he will become more in touch with his feelings. This article is based on presentations given by Dave Sylvestro, and a workshop co-sponsored by SPED*NET Wilton, Norwalk SPEDPartners and Norwalk Public Schools. Sylvestro is a school psychologist at Eagle Hill School in CT. Eve Kessler, Esq., a criminal appellate lawyer with The Legal Aid Society, NYC, is co-founder and President of SPED*NET Wilton, Special Education Network of Wilton (CT), www.spednetwilton.org, and a Contributing Editor of Smart Kids.